The wife of the retired soccer player who has been locked in a bitter divorce just got a restraining order against her estranged husband, after claiming he's been stalking and harassing her. Sarah Jones claims in legal docs Jermaine Jones has been following her around town, despite an agreement they struck last December to stay away from each other. Sarah filed for divorce last month ... this after he accused her of having a sexual relationship with David Charvet. David denies they had such a relationship, saying they were just friends. 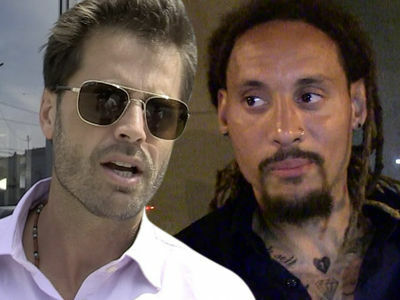 Sarah claims in the docs, Jermaine has followed her to a market where she was shopping and then followed her car after she left, showed up at the Soho House where she was having lunch and sent her numerous "inappropriate, antagonistic and degrading messages." Sarah says in the docs, "I believe Jermaine has acted this way to harass me, control me, intimidate me and disturb my peace of mind. I am scared of Jermaine's stalking behavior, Jermaine's monitoring my movements, Jermaine's harassing messages and Jermaine showing up at locations right when I am there." The judge ordered Jermaine to stay clear of Sarah and their daughter ... at least temporarily. Team USA's Jermaine Jones Ditching MLS to Retire in Europe, Then Coach!